After the slipper madness... I'm back to socks. I have a couple of birthdays coming up and socks it's going to be. I've really fallen in love again with knitting and wearing wool socks. And I also really like giving them away as gifts. 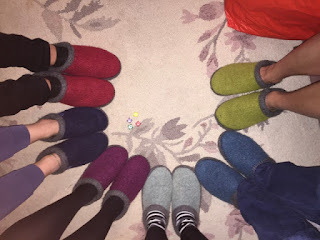 But first, just one last photo of the slipper madness! And this is the pair of socks I've just finished for a friend. They will be in the post tomorrow. 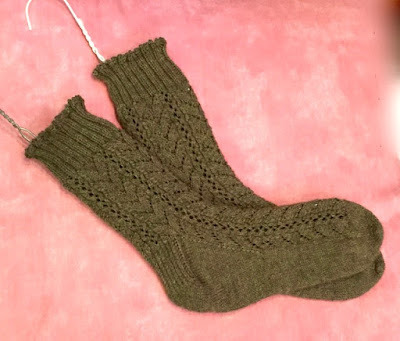 I've used this pattern before - it's "Herringbone Lace Socks"
I have another birthday next month. This time I've gone for a plain knit with a self-striping yarn. centre-pull balls to make sure both socks match. which keeps everything really neat and tidy and easy to work with. Apologies to those who like to come to my blog for tatting as I've still not got back into it after my Christmas snowflakes... but I'm sure it won't be long before inspiration strikes and I pick up my shuttles again. For now though, I'm enjoying knitting. The West Yorkshire Spinners wool I'm using for the current pair of socks is really lovely and a joy to knit with. Such wonderful socks and those slippers! I love the coat hanger blockers too! Ooh, I love socks - knitting them, reading about them, I'm happy! I like the lacy ones, but the ones you're working on now are really splendid. Love your felted slippers too. Mary Corbet is embroidering on felt mittens, that might work on your slippers too. Hi Jane, oooh! aaaah! Mary Corbet! 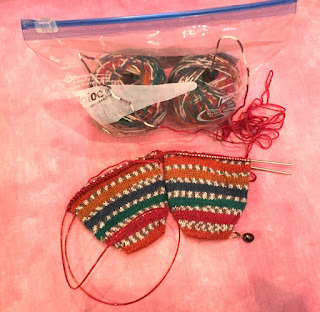 The mittens on her blog right now are just amazing! Thank you for telling me about her. Do you knit socks with contrasting heels? What's your favourite heel for contrasting? I love the slippers (they look very cosy) and the socks as well. My grandma used to knit us socks and she used wool she spun herself, so they were pretty coarse, but yours look very soft. I'm sure your family and friends will enjoy their gifts. Oh how I wish I was a member of your family! 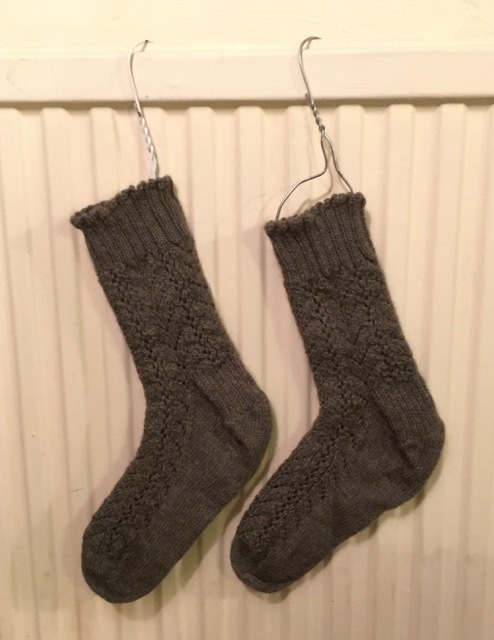 To receive something as beautiful as a pair of homemade slippers or socks would be such a joy. I wish I had someone to teach me how to knit! I am sure who ever has your socks will enjoy wearing them. That's a great idea putting the knitting in a bag with two holes. When I have knitted this kind of wool I do try to match up the colours I do hate these items knitted with this wool when they start with different bits of the wool some of the baby patterns look a total mess with mis match bits, it does not long just to find the piece of the wool that matches so you have two fronts roughly matching or two sleeves.